Since I started writing the EA Navigator and other tools the code has been open source and available on Github. The code is split up in a tool-specific part for the EA Navigator and some other tools, and a framework that can be used to build your own tool. The code for the framework and the tools is published on GitHub, a version control repository “in the cloud”, which is free for public repositories. The easiest way to download the code is to install GitHub for Windows. That allows you use the Clone in Desktop button on Github. Make sure you put all the projects in the same directory as otherwise the references would be broken. 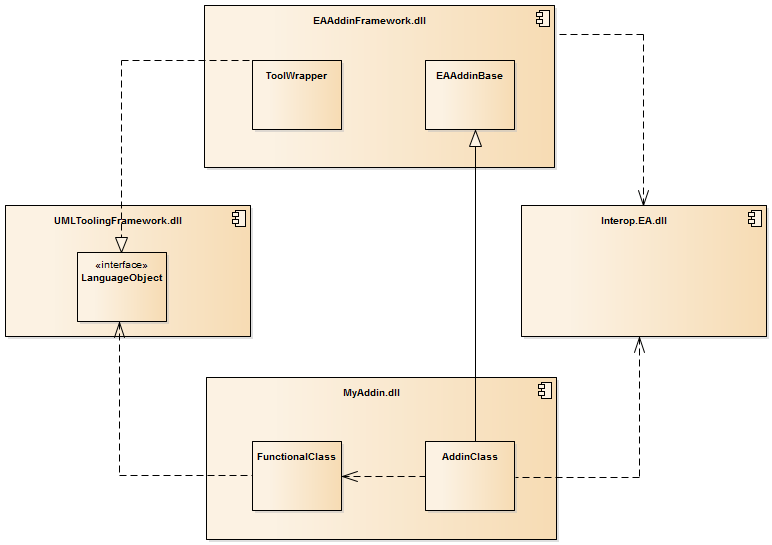 The code for the EA Add-in framework is written in C# using SharpDevelop. You can also open it with Visual Studio or another C# IDE, but then you’ll have to remove the wix projects from the solution. You can open the complete code in either the Enterprise-Architect-Toolpack \Total Solution.sln or in case you only downloaded the framework then Enterprise-Architect-Add-in-Framework\Total Solution.sln but make sure to start you IDE as administrator. Before compiling check the reference to Interop.EA. I’ve set it to point to C:\Program Files (x86)\Sparx Systems\EA\Interop.EA.dll but if you have EA installed in another directory you’ll need to replace the existing reference. Once the references are OK you should be able to compile the solution without any issues. To be able to understand the architecture of the framework you’ll have to understand the pattern behind it. On the right you see a diagram of the general modelling tooling pattern. This pattern describes how to create tools that extend the features of a standard modelling tool in order to support the modelling method used. This is the pattern I use whenever I develop an Enterprise Architect add-in for a client. The LanguageObject is an interface that represent the object of the modelling language. In the case of UML each meta class of the meta model is represented as an interface. The LanguageObjects are completely independent of the modelling method or modelling tool used. Once finished this layer hardly ever changes. The LanguageObject is then implemented by the ToolWrapper. There will be a ToolWrapper layer for each supported case tool. The ToolWrapper wraps the ToolObjects of the case tools API using the adapter pattern. The MetaObject is only required when you are implementing a tool for a specific modelling method. These MetaObjects represent the meta classes of the modelling methods meta model. They wrap the LanguageObject using the adapter pattern. General tools that are not specific to any modeling method, such as the EA Navigator can skip this layer and use the LanguageObjects directly. The Client is the actual tool. It only uses the MetaObjects to actually do its job. In order for this pattern to actually work, it is really important that the dependencies and layers are respected. To make an add-in you’ll always need three components similar to the three repositories on GitHub. You can see how these component map onto the pattern on the diagram. The UML Tooling framework implements the LanguageObjects of the pattern for the UML language. Each element of the UML meta model is represented as a interface defining all attributes and operations as defined in the UML Superstructure. This component implements the ToolWrappers of the pattern. This component actually knows about the Enterprise Architect API. It hides all the ugliness of the API behind a clean set of UML interface implementations. There is a also a bunch of helper functions and stuff like that to make things a bit easier to work with. The Enterprise Architect Add-in Framework also contains an abstract add-in class EAAddinBase that you can inherit from to quickly create a new add-in. The add-in component is the part that is specific to the add-in. It contains the actual logic and behavior that needs to be executed. This is also that part that you tell Enterprise Architect about. EA will then call the prescribed methods such as EA_GetMenuItem or EA_MenuClick on the AddinClass at the appropriate moments. When done correctly only the EA_ operations use API objects in their parameters. The first thing they should do is create the appropriate wrapper class and execute the required behavior on that wrapper. We cannot avoid the dependency to EA’s API because of the parameters in the EA_ methods, but it should be restricted to the parameters only. Make sure the only class that depends on Interop.EA.dll is the AddinClass, and leave this class as bear bones as possible. 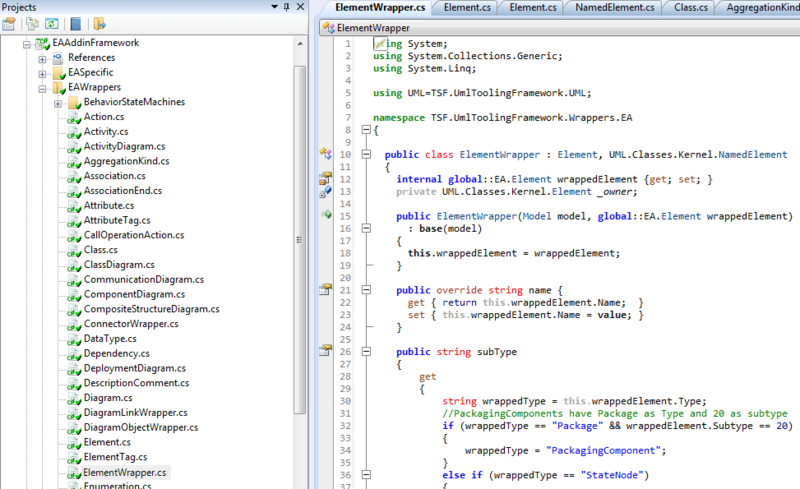 All functionality should go into functional classes who don’t depend on Interop.EA.dll. You could even consider to split the MyAddin.dll into two parts, one for only the AddinClass, and one for the functional classes. This would definitely be the preferred architecture once you have multiple add-ins that somehow can re-use some of the functional classes. This entry was posted in Sparx Systems Enterprise Architect and tagged add-in, C#, Enterprise Architect, GitHub, Sparx Systems, tutorial. Bookmark the permalink. Geert, this all looks great and very professional to me, thanks a lot for sharing! I have managed to clone the repositories so far. And I have found out, that WiX is compatible with VS 2013 (of which I use the community edition). So far so good. But VS on building the solution, the UMLToolingFramework compiles OK, but the EAAddinFramwork doesn’t compile, VS reports “Could not locate the assembly “LogicNP.CryptoLicensing” . This seems to be a 3rd party library and I don’t really know how to proceed. Any hints you (or anyone else) could give? If you don’t want to use this then you should be able to remove the reference and comment out the sections in the code that use this library. I should figure out a way to make that easier I guess. If you have any ideas let me know.